January wrapped up really quickly. 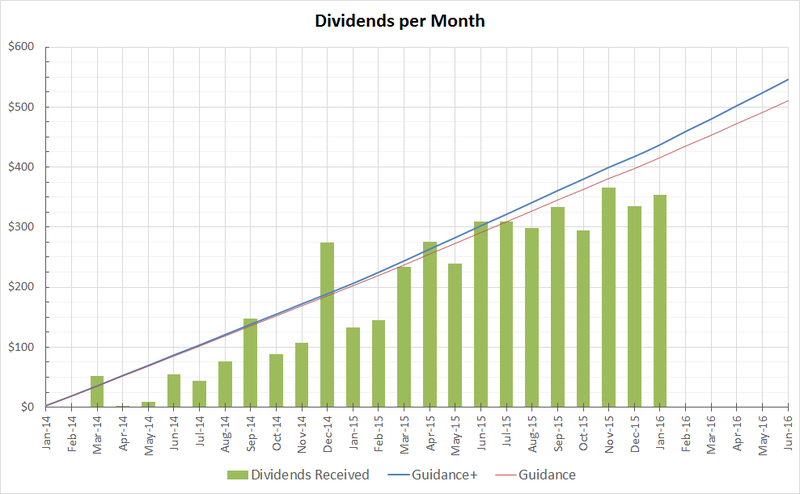 The market shows volatility but my dividends don't, they just keep going up! Here is the list of juicy dividends that I received in January. It seems I'm a bit behind my original plan but I will wait out later this year to see if I need to revise any goals. You're off to a great start Young. Keep at it and slowly and surely, you're conquer all your goals and dreams. Thanks for sharing and I'm glad I've found you. Will be following your journey. Cheers buddy. Looks like a solid start to the year to me YD! $200+ in your taxable and $350+ across all accounts. That's some good stuff. I wouldn't be too concerned with being a bit behind schedule thus far there's still a lot of year left to go. Good going, Young Dividend! January and February usually are slower months as far as dividends go (depending on your portfolio of stocks, of course), so I wouldn't be too concerned if your behind a little. After March (which is a quarter-ending month), you should be able to tell if you're on course. Thanks everyone for the comments, I will keep you posted on my future progress. I am filing my tax return now so hopefully I will get a nice boost in the coming weeks.